But where are we moving? How far do we move? 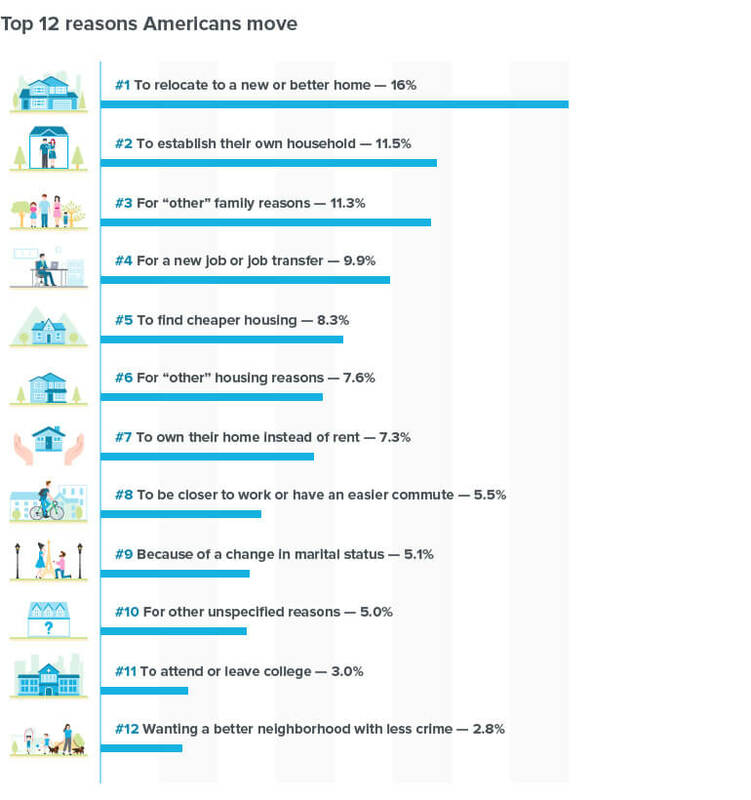 And what are the most common reasons for picking up and starting life in a new home? We’ve compiled a few interesting facts and statistics to answer these questions and give you some insight into how Americans are moving from A to B. In 2017, only 11% of the US population moved. This is the lowest moving rate since the Census Bureau began tracking it in 1948—a year which saw more than 20% of the population relocate. 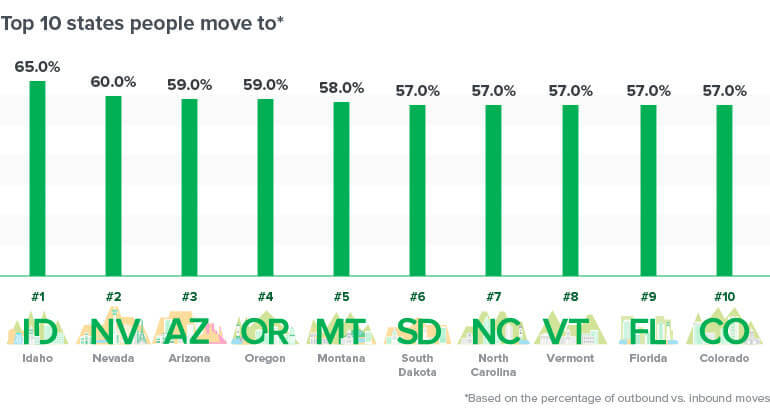 62% of movers in 2017 remained in the same county after their move. 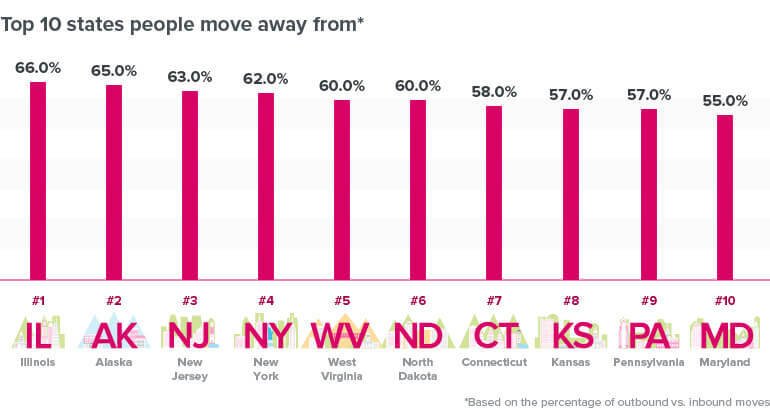 34% of movers relocated to a different county (including same-state and different-state moves). 4% of the moving population came from abroad. When we are compelled to move out of state, however, some states see more people departing their borders than coming in and settling down. We all have grand dreams of moving to the coast or starting a new life in the big city, but you may be surprised to learn that only three states in the top ten have an ocean view and only one is home to a city with a population of more than 1 million people. When you move to a new city, one of the first questions people tend to ask is what brought you there. Did you move for work? Did you move to be closer to family? Did you move to get away from family? The reasons are endless. Who moves more often: owners or renters? It shouldn’t come as a big surprise that renters hop from place to place a bit more often than owners. Leases only last so long and if you’re stuck in an apartment next to an aspiring accordion artist, you might not have too much incentive to renew. Only 21.7% of renters moved in 2017, compared to the 35.2% of renters who moved in 1988 when these numbers were first being tracked. Owners are also staying put for longer periods of time. In 2017, only 5.5% of owners moved, while 1988 experienced an owner-mover rate almost twice as high at 9.5%. Everyone has their own reason for moving, but when it comes to choosing how you’re going to get your belongings to your new abode, there are only three real options: Hiring a professional moving company, renting a moving truck, or doing the whole thing yourself. Whether you rent an apartment or own a luxury villa, it’s more than likely that you’ll be moving at one point or another (you’ll get tired of that boring old villa eventually). But when it comes to hiring a professional mover, who’s footing the bill? Individuals make up 44% of household goods shipments. Corporations sponsor the second largest group of household shipments at 39%. The military is responsible for 16% of the nation’s household shipments while the remaining 1% is completed by other federal government offices. Individuals are responsible for less than half of all professional household moves—meaning the odds are in your favor that either your employer or Uncle Sam will help pay for your move. Let us help with your next move! Are you planning on moving soon? Whether it’s next month or next year, be sure to check out our ultimate homebuyer checklist to get everything ready, or find the mover that’s right for you with our Find-a-Mover Tool. Do you know any other interesting moving facts or statistics? Let us know in the comments below! Colin Holmes is no stranger to moving: he’s done so five times in the last five years, and he’s used his expertise to help over 185,000 readers plan their moves in the last year alone. As a former journalist and documentary interviewer, Colin brings a wealth of research experience to Move.org. Hey there, did you find any information on total moves, by state? Say California, was there any accurate information in your research that showed total moves in California? If the above data is correct then it should be between 45-57% in favor of moving to CA. If you look at ttps://www.sandiegouniontribune.com/opinion/the-conversation/sd-california-losing-low-income-people-gaining-wealthy-people-per-report-20180221-htmlstory.html , then you can see CA population appears to be on the decline at around the 45% mark. HOWEVER, People making $55,000 or less a year were mostly moving out of California between 2007 and 2016, the report found, while people making more than $200,000 a year moved in.